This market price is trading 7.00% discount to its NAV (Net Asset Value). The total expense fee is 1.79% per year. Morningstar has ranked this U.S. stock fund with 2 stars and neutral rating. In 2014, the year to date return is 17.34%. This closed end fund has returned 13.05% over the past 1 year, 20.60% over the past 3 years, and 11.55% over the past 5 years. 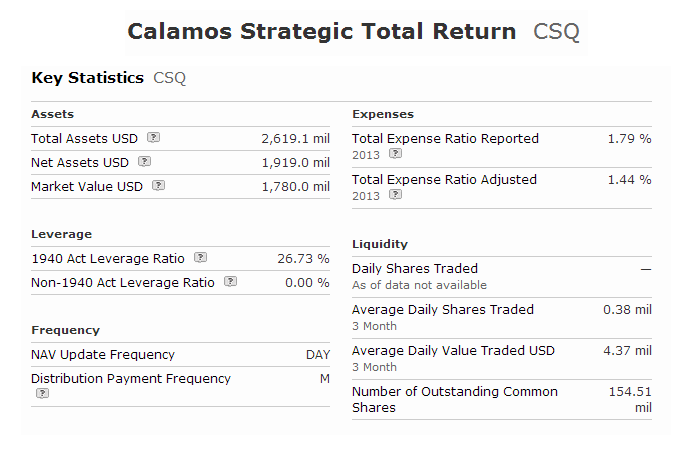 This Calamos Strategic Total Return Fund has 252 holdings in its portfolio. Top 6 stocks in its holdings are Apple, Inc., General Electric Co, Wells Fargo & Co, JPMorgan Chase & Co, Citigroup Inc, and Microsoft Corporation. Top 4 asset allocations are general equity (53.80%), convertibles debt (20.76%), corporate bond (16.89%), and convertible preferreds (7.35%). This Calamos Strategic Total Return Fund has a high yield of income for investors. The market price is trading at discount to its NAV. The expense fee is a bit high.